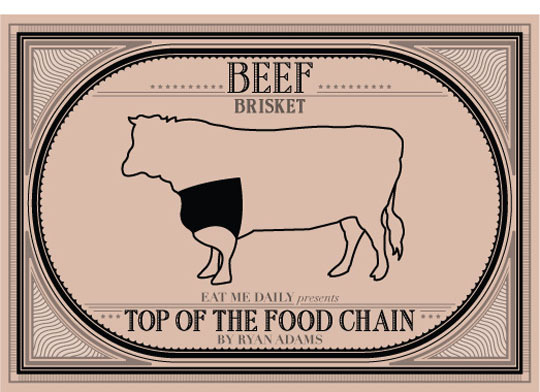 Welcome to Top Of The Food Chain, a column from Eat Me Daily's meatiest columnist, Ryan Adams. Every week we'll attempt to demystify the options available in your supermarket, breaking animals down piece by piece so that the next time you find yourself staring at endless Styrofoam containers, you'll be able to make an informed purchase. This week: Brisket. Ryan is taking this week off; in his stead, please welcome guest blogger Matt Davidson. Brisket can conjure the smell of a billowing smoker, the warmth of friends and family at Passover, or a disappointing cut of tough, blackened meat. It holds a firm place in varied traditions, largely because it is a large and economical cut. While often a fickle piece of meat to cook, with enough patience and a solid technique you can produce a voluminous amount of tender meat on the cheap. 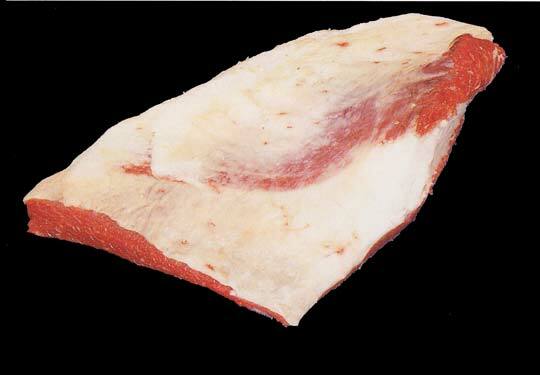 Brisket, which is cut from the breast of the cow, must be cooked low and slow for best results. The cut is usually cheap, around $2.00 or less a pound. 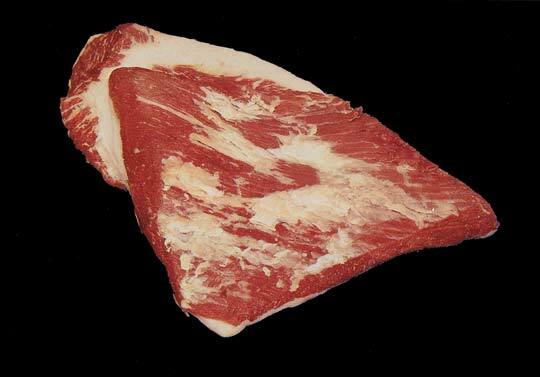 If you go to buy brisket at the supermarket, you’ll usually find two different cuts: Packer, which has all of the fat cap, and Trimmed (sometimes Super Trimmed). The supermarket I go to usually has a few of both, but generally has more of the Packer cut. In Texas, brisket is a barbecue staple. A Texas-style brisket is smoked for hours and served on white bread with pickles, onions, cheddar cheese, and barbecue sauce, with sides of baked beans and potato salad or coleslaw. Brisket is also commonly served at Jewish Passover celebrations. The meat braises for hours in a pot with onions, carrots, and garlic. Traditional sides for the brisket are haroset (a fruit and nut spread), matzo ball soup, and an unleavened cake. 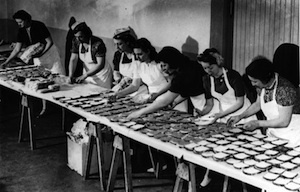 Both the Packer and the Trimmed variation feature two “sections” to the meat, called the flat and the point. The point is the knobby looking part of the brisket at one end, and rests on top of the flat, which makes up the bulk of the cut of meat. If you purchase the Packer cut, make sure you have a sharp knife you can use to trim the fat. The ideal fat cap, usually referred to simply as the “cap,” is about quarter-inch thick. You can view this by looking at the cut length-wise. You’ll want to trim some of the fat in order to get an even, quarter-inch thick cap, although slightly more fat on the point is tolerable; try to get a view on the point from many different angles to figure out how thick it is. If you cut down to the meat level, just back the knife out and start shallower. The Trimmed or Super Trimmed cut is a mixed bag. Sometimes you can find a brisket that has a perfectly sized cap, but often the cut is trimmed too thin for slow cooking. That said, these cuts are worth sorting through at the supermarket. Trimming works the same way as it does for the Packer cut, though you’ll likely need to trim much less. For both cuts you’ll want something in the 8-12 pound range, which feeds about 20 people. This isn't the simplest of preparations for brisket, but it is traditional, and with Memorial Day coming up I figured some folks might be willing to give it a go. You'll also need some red wine vinegar and olive oil, and either lump charcoal and wood chips or logs for the fire. I prefer hickory, but pecan works as well. Prepare the meat with the rub 12-24 hours before you cook it. Mix the spices in a large bowl. Lay down a large piece of foil on a pan, and place the brisket on it. Pour some red wine vinegar and olive oil on it and rub into the meat. Pat a healthy amount of the spice rub on it it in with your hand, then flip the meat over and do the same on the other side. Do the fat side second; if you run out of rub it is not a travesty if the cap is not covered. Make sure to coat the sides as well. After the meat is covered in rub, wrap it tightly in foil and place in the refrigerator. Take the meat out of the refrigerator about an hour before you put it on the smoker. 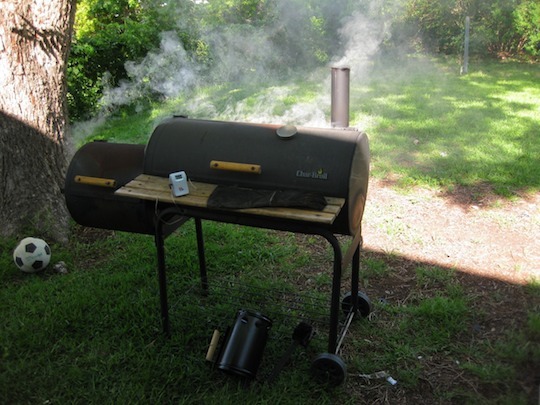 Get your fire going and make sure the cooking chamber is about 225 degrees; here's a basic tutorial on getting your smoker going. Over 250 and below 200 are bad, but it’ll turn out fine as long as you stay within those bounds. Unwrap the meat and place it on the smoker, fat side up. 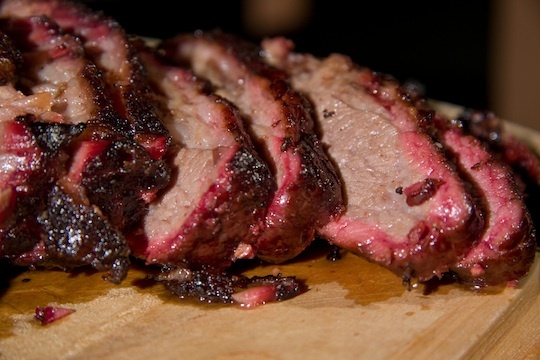 Hit the brisket with a big dose of smoke to begin with so that the rub forms into a bark. Monitor the temperature, but refrain from opening the smoker unless necessary. After 4 hours, or when the meat has a bark, prepare and apply the mop. Mop is a sauce that is poured over brisket while cooking to keep it moist. Melt a stick of butter, add the chopped onion and saute. Then add the vinegar, brown sugar, and beer, and simmer for 10 minutes. Take off the heat and spoon this mixture over the brisket every hour or so. It usually takes about one to one and a half hours of cooking per pound of meat. While most beef is considered done at 175 degrees, you want to smoke the brisket until it reaches 180 degrees on an internal thermometer. Taking the meat up that additional 5 degrees breaks down significantly more connective tissues, resulting in a sliced cut that has a buttery, crumbly texture. Always cut the meat perpendicular to the grain. This is easy enough to figure out for the flat, but the point does not have a uniform grain direction. Make some exploratory cuts into the point to see where the grain goes. Serve with white bread, pickles, onions, cheddar cheese, and barbecue sauce. Wolfgang Puck's Wine-Braised Brisket of Beef with Caramelized Pearl Onions and Dried Apricots. Padma Lakshmi's not messing around with this bacon-wrapped brisket. Brisket braised in Midwestern Mole from Food52. Passover Brisket ala Emeril Laggase.